As you might expect it looks messy, although we clearly have an upward trend in the data with the typical seasonal fluctuations around that trend. These tax collection numbers will surely provide fodder for callers to my guest spot on the Jarrod Thomas Show to suggest the city does not need new taxation if revenues are increasing like this. Switching gears a bit though. 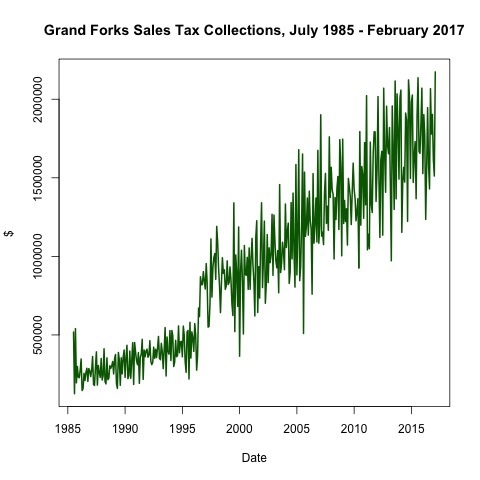 JT and I are looking at the economic data on the Grand Forks flood some twenty years on to see what is happening. 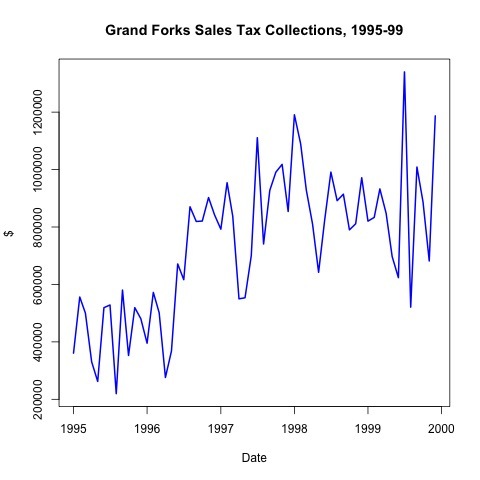 I thought we would look at the sales tax data around the flood event. What is of particular note here is not the flood event itself. It actually occurs earlier in the data series. In 1996 there is almost a parallel jump in the tax data to a new higher level of tax collections. It may also be the case that the rate of growth increased as well (when looking at the first graph), though that is far from clear. The flood months saw a drop in collections (not a surprise) and a recovery in the next few months (also not a surprise). JT and I will be exploring many aspects of the data surrounding the flood event and the recovery. If you have suggestions for data series you want us to look at and discuss, give JT a call or drop him a line and he and I will see what we can do.